When Yard Crasher Winners Tom, Brooke and baby Isabella entertain these days, which is often, it usually involves whipping up something in their WerEver outdoor kitchen as a custom-made BelAqua fire-water fountain splashes in the background and synchronized LED lights twinkle all around. Nearly four months after their stark backyard got a whirlwind $35,000-plus makeover, Brooke and her husband still marvel at the luxury of it all. For one thing, as TV viewers will learn, the petite 29-year-old handily beat another “Yard Crashers” hopeful in an arm-wrestling match to win her spot on the DIY Network’s popular show. That was a departure from his usual gambit of stalking unsuspecting shoppers in California, and it vexed poor Hassan. As hundreds of fans begged to be chosen, it became painfully obvious the good-natured landscape architect doesn’t like saying no. At the end of a very long day, though, the Iarossi’s empty backyard beckoned. “We had a big blank slate of a yard and didn’t know what to do with it,” Brooke said. “We did most of the inside (renovations) ourselves,” Tom, 31, tells Hassan on the show. On the show, Brooke explains what she wants: More than a rusty, mismatched fence for privacy. A place to get together with friends for wine and ugly sweater parties. “We like to cook outside,” she says. 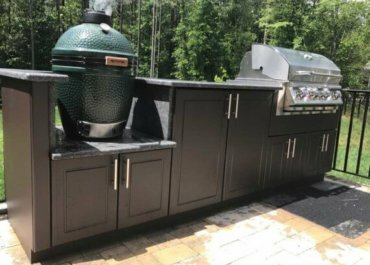 The virtually indestructible kitchen by WerEver Outdoor Products in Tampa is her favorite feature, she said last week. The cabinetry alone is valued at $6,000. It also has a built-in gas grill, side burner and under-the-counter beverage dispenser. And Brooke picked up a new skill while helping put it together: She can now tile and grout. Besides the kitchen, waterfall fountain and remote-controlled light system, the 48-hour makeover included a raised pergola with lounge chairs, shell pathways, a stone bench and a swing for Isabella, now 13 months old. The lead contractor was Outdoor Impressions, a Valrico company specializing in paver stone projects. The centerpiece of the shady yard is a large old camphor tree. TropicScapes of Valrico/Brandon added Florida cypress, birds of paradise and bromeliads, among other plants, along with an irrigation system. The new landscaping is doing well, Brooke reported. Working with Hassan and the “Crashers” crew was a lot of fun, she said. But no, she’s not looking forward to seeing herself on TV. And the serene new yard makes life no less hectic.